One component liquid polyurethane waterproofing membrane of advanced technology, with silane modified resins. Developed with new age mixing technology that creates a unique waterproofing flexible sealing membrane with highly developed mechanical strengths. Its final surface is exceptionally durable and resilient; thus it does not require any kind of additional enhancement from a varnish or other surface fortifying product. 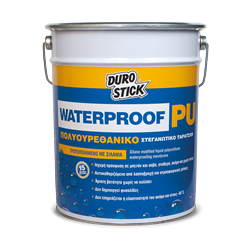 DUROSTICK WATERPROOF-PU is applied easily on terraces, roofs and planters without primer when those surfaces are dry, clean and free from loose materials. Note: After applying the product on roofs, terraces or bathrooms, the installation of tiles or natural stone is not recommended. For such cases, DUROSTICK recommends to waterproof the surface prior to the lining installation using one of our cementitious waterproofing products HYDROSTOP FLOOR, D-1, HYDROSTOP WATERTANK, HYDROSTOP ROOF or the TWO COMPONENT HYDROSTOP. •Minimum consumption: 1.0 to 1.3lt/m2 for the necessary two coats, depending on the substrate. •1.5 to 2.0lt/m2 for three coats, depending on the substrate (15 years warranty).